I’ve never spent too much time in Williamsburg in the snow. I have to say that it gives the whole neighborhood a charming feel. Snow always messes with the senses, I think. Everything seems quieter, or at least muffled. There’s a sound to snow, like a silent static that other sounds need to get through. It’s also just dark so early. I don’t feel warm and fuzzy about this neighborhood during the winter, but the snow made everything look enchanting. There was a weird unmarked dark bus parked on Bedford, which offered pictures with Santa and some drinks inside. That was a little creepy. I’m not in the habit of getting into weird buses to drink wine and sit on a strange man’s lap. I went Christmas shopping with Ryan and his sister, however, I ended up getting things for myself. Tracy and I both saw respective ear warmers/mufflers that we liked, so we bought each other one and switched. Something like that. 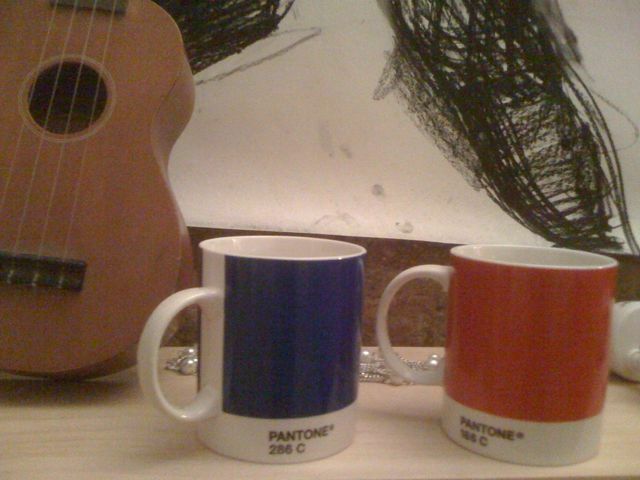 I bought these Pantone colored mugs with the color label on the bottom. I’m really taken with them. I love the concept and I want to collect more colors. For now, we just picked up the primary colors of red 186 C and royal blue 286 C.
I love the concept and I love how easily they integrate with our other things. I am even tempted to get a mug for myself to use at work. I am that tickled by this idea. It would be awesome if I could get a custom mug with the specific Pantone color of our logo, that would be awesome. D at live events would laugh, as half the time we’re trying to track down particular shades for banners and other materials. 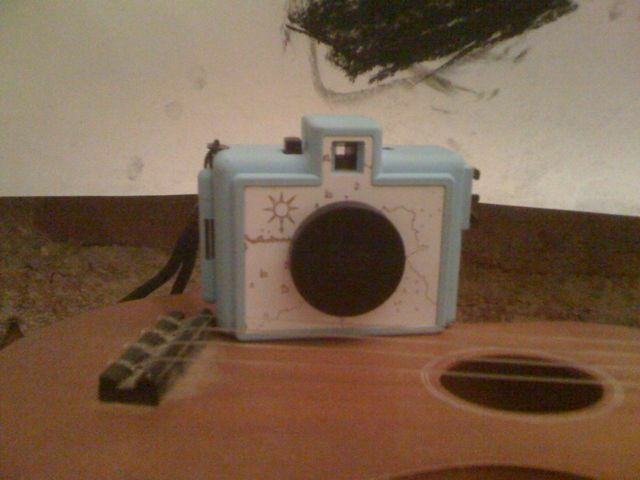 Otherwise, I’ve been playing with a lomo-esque camera that Ryan got me this year, for Christmas or an anniversary present, or something. Who knows?! He found it at Paul Smith and it’s rubber/plastic exterior is really pretty. It splits the frame of the picture in half, so that instead of 36, you can shoot 72 photos, where two frames taken in conjunction share a shot. I look forward to see how my play shots come out. But the snow, people are calling it Snowpocalypse, why? I mean, we get bad snow. I don’t know why Delta and Jetblue refused to fly. I guess we aren’t used to getting snow so early in the year. I remember last year we barely got a white Christmas. Usually it snows during January or early February. Either way, this unexpected snow fall in the east coast caused Jetblue to cancel all flights out on the 20th from the Boston and NY area, offering no other contingency plan other than a free booking on Christmas day. It was ridiculous. The customer service representation that we spoke to originally was even smug about it all. Finally in the middle of the day after being on hold for well over 5-10 minutes, there was a voicemail that asked us to call them back at a later date due to the high call volume. I know I will be very reluctant to fly Jetblue in the future, since if something goes wrong, they will be less than accomodating. Other Airlines have packages and contingency plans with other airlines and WILL book a flight for you on another carrier. Jetblue will not. In other news, the other week we finally put up some art that we bought. I bought some sculptures before Thanksgiving by artist, Darla Jackson. Her What are you afraid of? piece caught my attention. She juxtaposes animals in very human poses and emotions that I completely dig. Her other works that I like include the Birthday Party series. 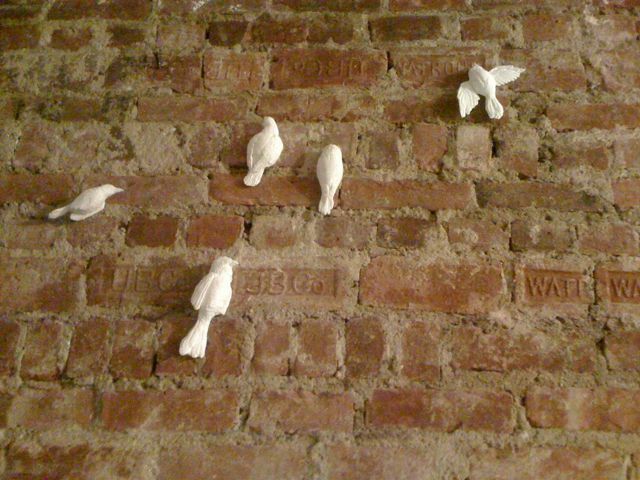 I couldn’t quite afford the bigger works and the one that I love best (unfortunately with my Cambodia trip in the horizon, I couldn’t even afford it in installations), but I really liked the flock installtions she did, and I bought some plaster birds from her. She was sweet and packaged them lovingly and securely, and mailed them to me minding some high maintenance requests. She also apparently had a baby recently and had to take time away from that bliss to mail these out to me, so thank you! We love them. I was SO afraid of taking them out of their packaging! I didn’t realize that the birds were so fragile… that plaster was so fragile. 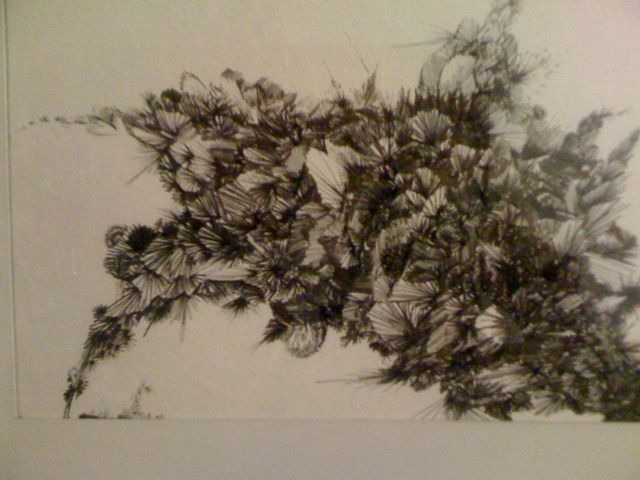 In the end, Kevin Curran from Laundromat Gallery installed them and the below art we bought from him, when he came over. 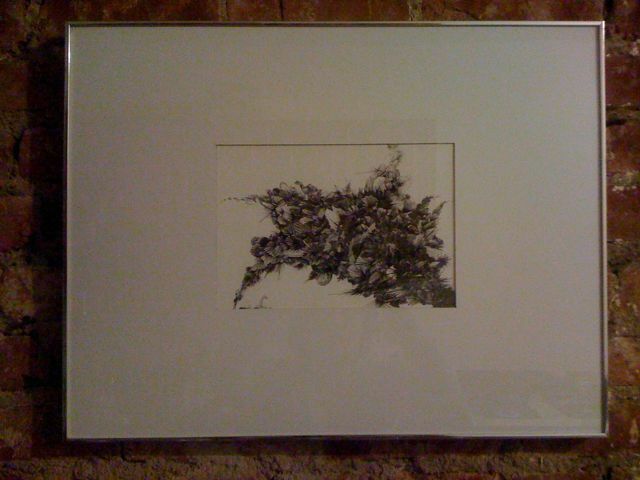 Months ago, we attended a Laundromat Gallery opening for Liz Atzberger, and Ryan fell in love with one of her works. Apparently it was priced accordingly so that no one would buy it, but that plan was obviously a “fail.” In return, Kevin offered to come over and install it and other works he needed hanging, like a commissioned poster of one of Ryan’s big works for Celebrate Brooklyn and NPR, for some beer. 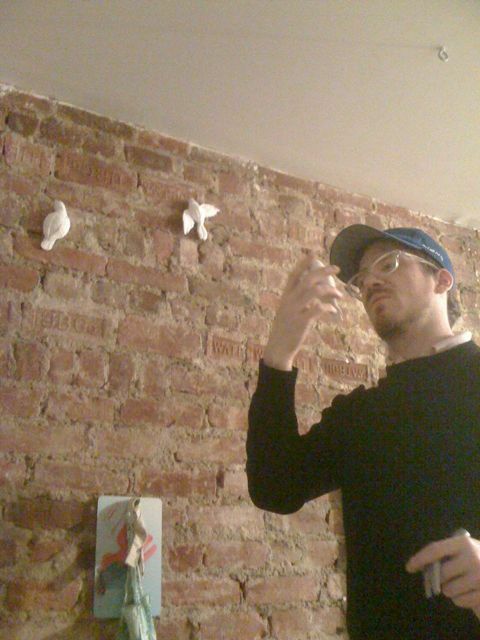 He was also nice enough to lend his services and expertise in hanging my bird sculptures I bought.